general posts not specific to any game or genre, often discussing the RPG community as a whole or playing RPGs in general. thoughts about good game design or how to do layout. suggested resources, such as reference works, television shows, or websites. sf and atomic horror genres. posts intended as humor, including rants. 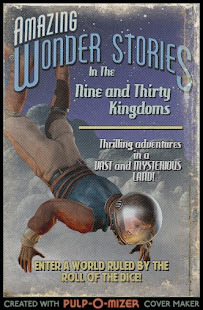 individual games: delvingdeeper, judgesguild, fantasytrip, inspectres (and the related game octaNe,) toon, plus some reviews. There are also numerous specific topic tags, such as combat, magic, hp, and xp. Musings about how to do a minimal, cheap version of D&D: D&D for 2.99 and the 2.99 follow-up post. Monsters Sorted By Treasure Type, a no-frills list from the LBBs and supplements. Defining sketchbox play in contrast to sandbox play.